I’m sad to report that my HP2133 mini note spends most of it’s time these days as a device for helping me do backups. None of my recent laptops match my mini note for portability but they meet my other needs for decent performance and light gaming. Last week I bought a Lenovo Ideapad Y460 from the Lenovo outlet. The machine has an amazing spec and buying from the outlet means you can save about 45% off the price on the Lenovo main site (look out for sales on the outlet). I’ve had Thinkpad’s pretty much my entire career and respect the quality of workmanship of these great machines. The Ideapad’s are not as sturdy but they do offer considerable performance for the price (when you pay the outlet price). I won’t get in to my experience with customer service at the outlet (basically abysmal) but the machine arrived in good condition, working perfectly. I’ve done two major upgrades since I got the machine last week. I installed 8 gb of RAM (it came with 4 gb) and put in a faster hard drive (going from a 5400 RPM to a 7200 RPM drive). As computer enthusiasts we spend a lot of time working with drives so I thought I’d document my experience of cloning the Y460’s drive. I chose the Western Digital Scorpio Black as the drive for the upgrade. It comes with an amazing 5 year warranty and was recently given the The Tech Report Editors Choice Award for 7200 RPM 500gb notebook drives. At the time of purchase the drive cost $59.99 (Newegg). To do the work of cloning the drive without having to buy an intermediate hard drive to perform a backup, I selected the Thermaltake BlacX eSata USB Docking Station. I wanted a docking station that did both eSata and USB 2.0 as I have machines with both ports. At the time of purchase the docking station cost $33.28 (Amazon). Having spent just under a $100 on hardware I wanted to minimize further cost so I looked around for a free, open source solution to drive cloning. After some research I selected Clonezilla, a free, open source alternative to the commercial cloning and backup software available. I installed Clonezilla on to a small (about 500 MB) USB thumb drive using the mechanism described here. The installation uses Tuxboot another free, open source utility available from SourceForge (where I used to work!). 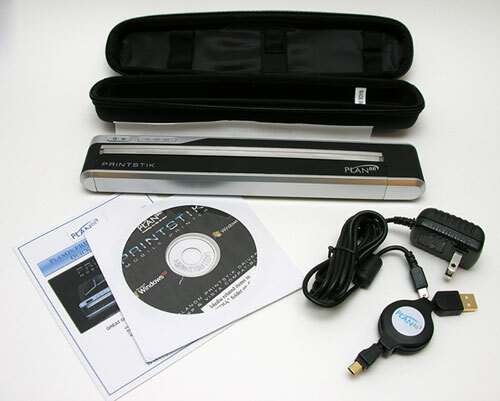 To download the software and setup the thumb drive will take you about 15 minutes, and requires no technical knowledge. Your thumb drive will become a bootable version of Linux, but don’t let this worry you! You will need to be able to select your thumb drive as the boot drive so you can do the cloning, but most modern BIOS’s provide this functionality. I admit that the thought of accidentally erasing the contents of my internal hard drive by incorrectly choosing the new drive as the source and my internal laptop drive as the destination scared the pants off me, so I did read a couple of tutorials on using clonezilla before going ahead. The process itself was seamless, and completed in less than 1 hr, including removing and installing the new drive in the laptop. Using the eSata interface my drive was being cloned at about 3 GB/per minute. The 500gb drive had about 70gb of content and copied in about 15 minutes. It’s great to be able to use free, stable, open source software to quickly clone hard drives. If you do decide to use the software, don’t forget to donate to the project - it’s the right thing to do. Here come the SSD’s for your netbook - 32gb for just $79? Did you get a measly 3,4 or 8gb SSD with your netbook? I know I did. I immediately switched it out for 120gb SATA hard drive so I could easily run Windows XP, load as many applications as I needed to be productive, and carry my entertainment with me. However, I felt pangs of regret as my HP mini-note then ran hot and was no longer virtually silent. 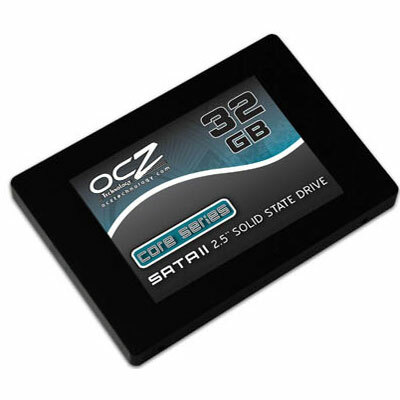 Now, OCZ have made high capacity Solid State Drive’s affordable. For a very cheap $79 ($139 before rebate) you could upgrade your notebook to 32gb running this new OCZ drive. Check out the reviews on NewEgg.com before deciding if these drives will work for you. 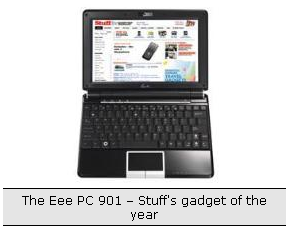 Brad over at Liliputing reported that the Asus Eee PC has recently won two awards, PC Pro Hardware of the year, and Stuff Magazine PC Gadget of the year (both UK publications). 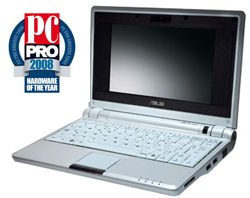 It was good to see the Asus beating out the Apple MacBook Air (I love my MacBook Pro, but the Air was a disappointment) in the PC Pro Award, and Asus being given the credit by Stuff magazine for defining a whole new genre of computers, the Netbook. Congratulations again Asus, may you continue to innovate for many years to come. A compact printer for your mini-note adventures? It’s been awhile since I’ve been traveling and not had access to a printer, but for those of you who might travel to more exotic or less hospitable locations the PlanOn Printstik looks like a worthy portable printing companion. Weighing in at just 1.5lbs, including the paper cartridge and with dimensions of just 1″x10.75″x1.5″ it looks like the perfect match for your mini-note. At $25 for three print cartridges, each giving you 20 full pages (!) you better make sure your printing something mighty important. Julie at The Gadgeter has the full review. Techbargains.com (a favorite site of mine) have put together a list of the different mini notebooks that are available today, or available for pre-order. They include the Asus EEE, HP Mini-note, MSI Wind (pre-order) & Acer Aspire One (pre-order). With the list they have include some basic specifications and a link to where the product can be ordered or the appropriate price grabber page. You are currently browsing the HP Mini Note PC Blog weblog archives for 'hardware' tag.